There are actually two other main methods for searching, and you can see those tabs at this point. There is the "Advanced Search" and the "Collections" methods. Collections is a wonderful tool to use but we are going to focus on advanced searching here because it is a more methodical approach. 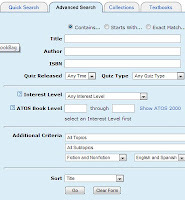 You can then be even more specific about the reading levels you want to search for by adding the numerical values into the boxes below the interest level you just selected. This works by deciding on a grade level (let's say 3rd) and then the time frame of the year. For example a reading level of 3.0 to 3.5 in those boxes means that you need a level from the beginning of the 3rd grade year to about five months into the 3rd grade. 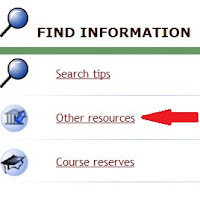 After you have selected the interest level you need then you can use the drop down boxes to select topics, subtopics, fiction or non-fiction and other criteria to narrow down your search. Most schools have moved to using this national list, but be sure to check with you child's teacher or school librarian to make sure and get their list if they have not yet converted to this one.